Right place, right time, and with a little help from your friends. That is how discoveries are made. All of those factors came together to verify the spotting of a Mexican Silverspot butterfly, Dione moneta on the eastern edge of Colorado Springs, Colorado on April 18, 2017. Sharon Milito is a geology lecturer at University of Colorado, Colorado Springs, and a retired Colorado Springs School district eleven teacher. She has also been a volunteer with the city for ten years, doing paleontology surveys and acting as a science education consultant. She has, in her volunteer capacity, access to places not open to the public, including Jimmy Camp Creek Park on the very eastern edge of the city. Sharon and I went scouting on Tuesday, April 18, and she took me to specific locations that seem to have a slightly greater biological diversity in the sprawling former ranch. It is a unique composite of many different habitats including mostly shortgrass prairie punctuated with sandstone bluffs. Some of the bluffs are covered in Ponderosa Pine forest. There is also Jimmy Camp Creek itself, a drainage fed by numerous springs within the property. There is almost always water in the creek, and some surprisingly deep pools in the sandstone bed. Otherwise, lots of mud trampled by cattle that still graze the park. 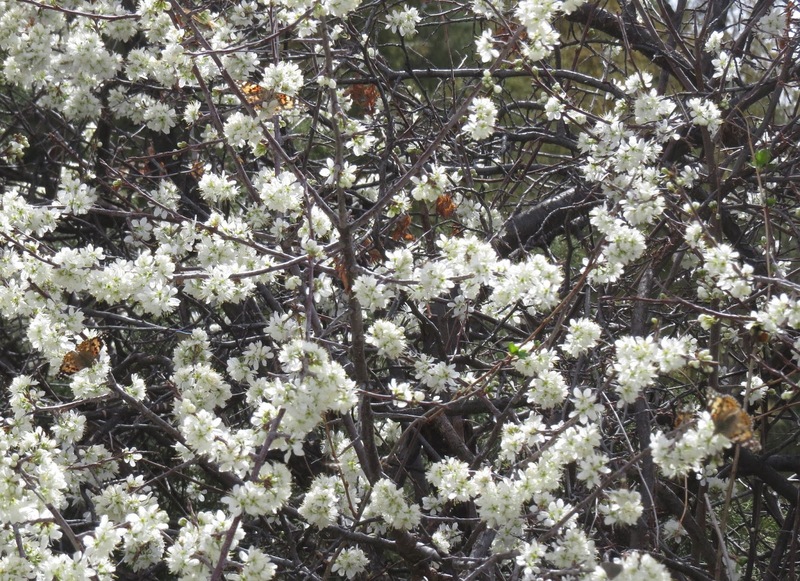 One of the areas we went to boasted a grove of wild plum, Prunus americana, in full bloom. It was like walking into a fairy tale. 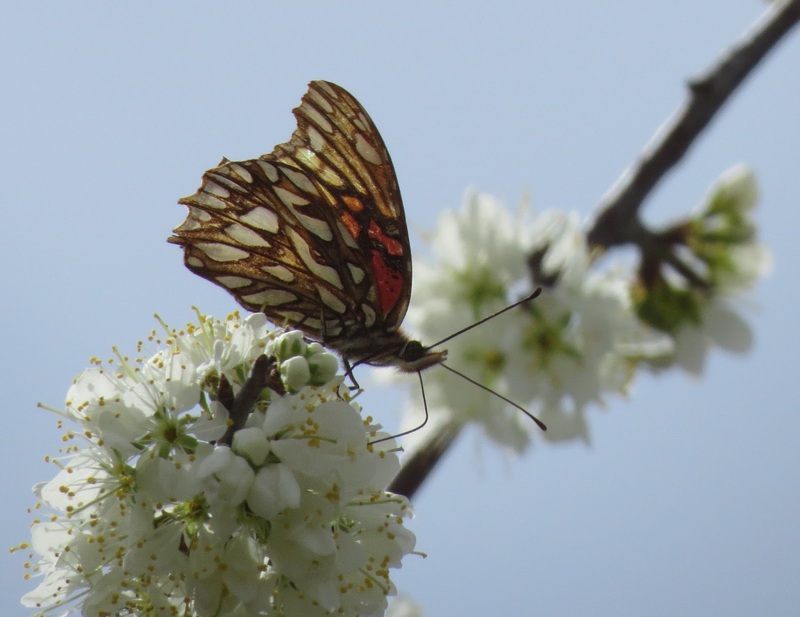 Hundreds of butterflies were sipping nectar from the blossoms. Most were Painted Lady, Vanessa cardui, but there were also Red Admiral (Vanessa atalanta), Milbert's Tortoiseshell (Nymphalis milbertis), Gray Hairstreak (Strymon melinus), Marine Blue (Leptotes marina), and several Monarchs (Danaus plexippus). Most of the Monarchs seem to have had a rough migration up from the south. The whole morning scene was mesmerizing and enchanting. Eventually, Sharon called me over to ask "what about this one here?" and pointed out a butterfly that had me perplexed initially. 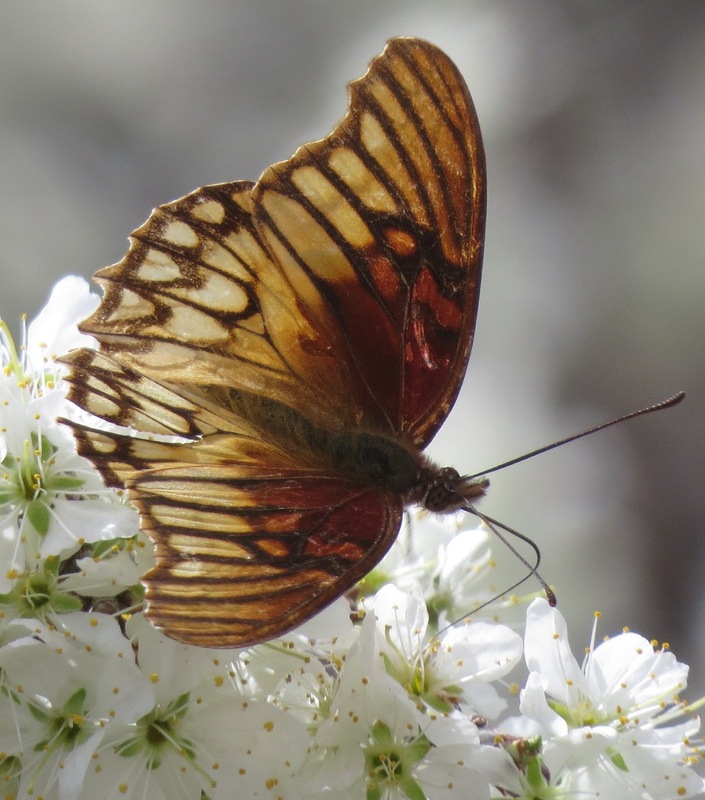 At first I thought it was a Variegated Fritillary, which would be expected at this time of year. The wing shape was a little odd, though, and when I glimpsed the underside, it was studded with large, silver spots. Wow, a Gulf Fritillary. That is not a very common butterfly in these parts. I got several images of the insect and we went our merry way. Later, I posted what I thought was our somewhat significant find to the Facebook group "Arthropods Colorado" for more folks to enjoy. Enter Robb Hannawacker. 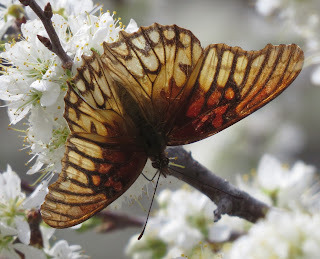 He raised the stakes substantially higher by proposing that the butterfly was in fact a Mexican Silverspot, Dione moneta. I was embarrassed to admit that until he mentioned it I was not even aware of the species at all, let alone where it is supposed to occur. Robb mentioned the identifying markings, and how our specimen matched them, and it is now pretty obvious that is what we have. According to my copy of the Kaufman Field Guide to Butterflies of North America, the Mexican Silverspot "Strays to south Texas, rarely to southwest and Big Bend region. More at home in mid-elevation tropical woodlands but reported to breed sporadically in lower Rio Grande Valley....Recorded late spring to late fall (multiple broods in Mexico." The butterfly['s normal range extends from Mexico through Central America to Brazil. 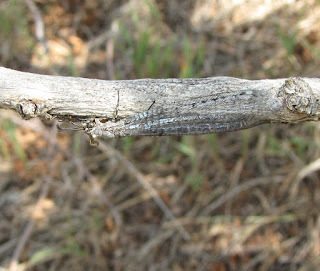 The larval foodplants are passion vines, which do not occur in Colorado. 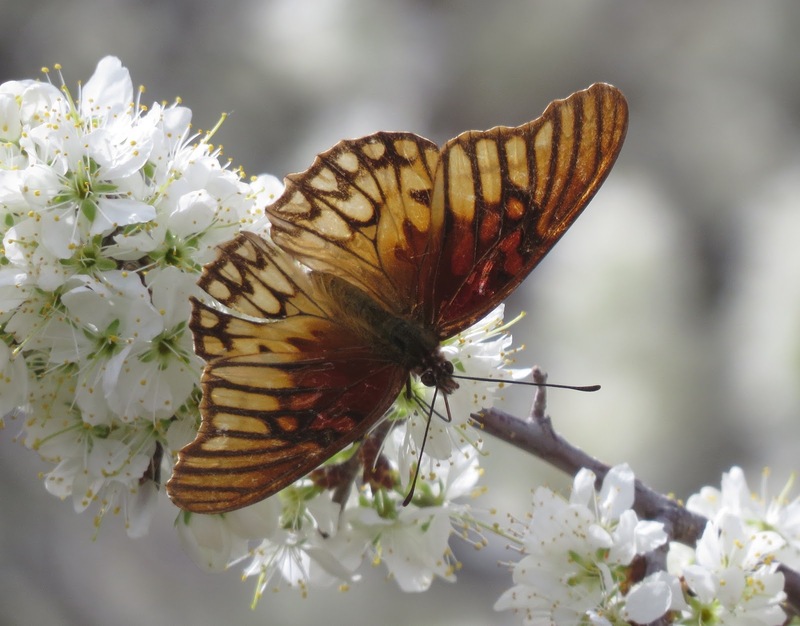 The most recent northern record for the species in the online database of Butterflies and Moths of North America was on May 8, 2005 in Roosevelt County, New Mexico, by Christopher Rustay. As near as I can tell, this is the first record for Colorado, at least of recent vintage. Please alert me to additional historical records. Thank you. Now, go forth and see what amazing species you can find. I am not sure whether it is a good thing or a bad thing that politics and consumerism are infiltrating the world of entomology, but in the case of General Mills versus....science, controversy could be a good thing if it informs the cereal-buying public. The well-intentioned corporate advertising campaign aimed at benefiting pollinators has hit a few snags, and the ramifications for future like-minded endeavors are complex. Partnerships with conservation organizations are, however, an excellent outcome. 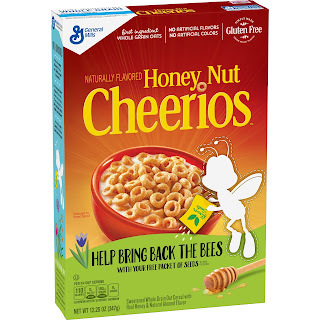 When the Honey Nut Cheerios® mascot "Buzz the Bee" disappeared from the cereal box to call attention to the plight of honey bees (and ostensibly the decline of all pollinators), it seemed like a genius marketing gimmick. Add the promise of receiving a packet of "wildflower" seeds to sow in your garden if you simply request them, and you have a win-win-win love affair at first blush. Who could object to stimulating environmentally-friendly action on behalf of imperiled insects like the Rusty-patched Bumble Bee, just added to the Endangered Species List? 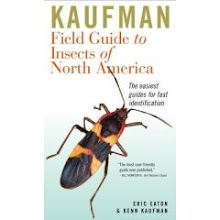 Well, it turns out that knowledgeable botanists and entomologists can object, and do so strenuously and effectively. The major problem stems from the seed packets that General Mills is dispensing, in partnership with Veseys Seeds. They are a "one size fits all" solution to a complex problem, and therefore no solution at all according to many scientists weighing in. There have been charges that certain flowers in the seed mix are not only not native to North America, but invasive species in some areas. Homeowners are certainly better off purchasing native cultivars at their local nursery, if only because native plants are better suited to local soils and regional climate. Another frequent complaint directed at virtually all pro-bee propaganda is that the sole intended beneficiary is the honey bee. Apiculture, it could be argued convincingly, is an industry, complete with large scale marketing, lobbyists, and other attendant business arms. The honey bee is not native, having been brought to the settlement of Jamestown in 1621 or 1622. Today, migrant beekeepers truck their hives across the country to pollinate various orchard crops, especially almonds. 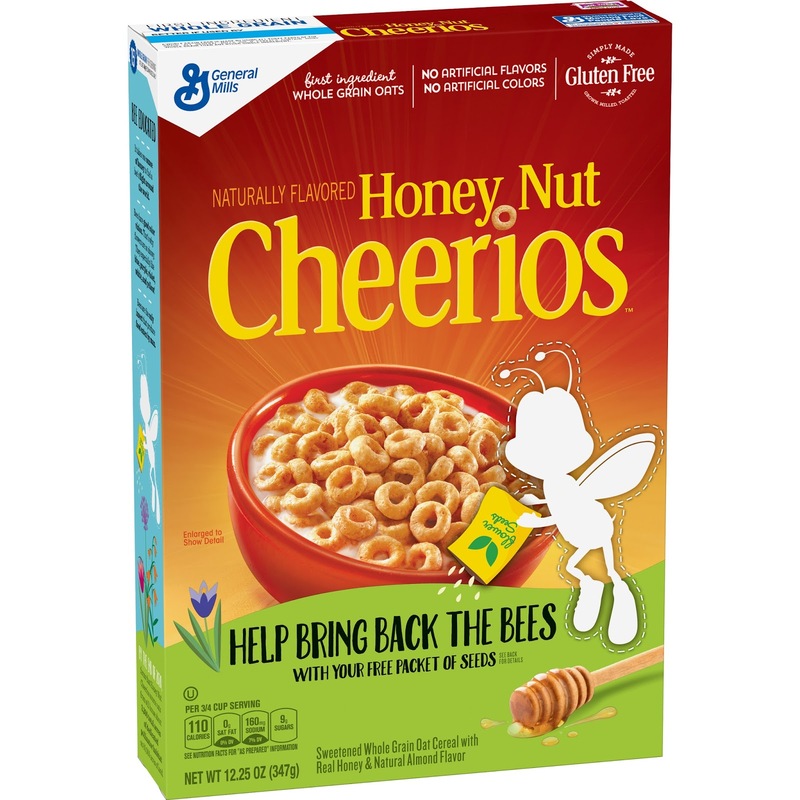 While Honey Nut Cheerios™ contains no nuts, it does contain "natural almond flavor." Interesting. "GM [General Mills] is partnering with the NRCS [Natural Resources Conservation Service in the U.S. Department of Agriculture] to support a half-dozen new staff biologists, who will be employed by Xerces and based in NRCS offices. GM and the NRCS have each committed to providing $2 million—a total of $4 million—over a 5-year period. You’ll find more information about what the staff will do and where they’ll be based at here. For an overview of the partnership, and the press release, [click on the links]. "We’ve [Xerces] got other partnerships with various GM brands (Muir Glen, Cascadian Farm, Annie’s), but any dollars from those, often tied to sales of a product, will be part of the $2 million above. "Xerces also has a contract with GM to work with their suppliers to create habitat on farms. We’ve already done some of this in California, planting hedgerows along tomato fields and hedgerows and meadows in almond orchards, and in Washington around blueberries, but this will be spreading across the country to farms supplying all manner of products. This is another multi-year agreement. I’m afraid that I don’t know what the total dollar amount will be over the years. 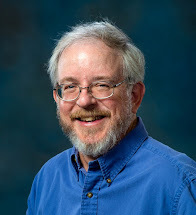 Hundreds of thousands for sure...."
I happen to like General Mills and Cascadian Farms products, so I am happy to be benefiting the Xerces Society when I make those purchases. I am also glad that I learned what is going on behind the headlines, which were far from flattering initially. 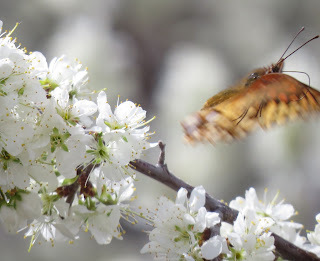 Meanwhile, my next post will revisit a workshop I attended back in March that speaks to the future of pollinator conservation at the homeowner-level. Stay tuned. Predator and Prey: Ants versus "Lions" and "Tigers"
My last post here chronicled predation on termites by ants in the wake of swarming events in my neighborhood. Today I shall turn the tables and demonstrate that ants are not immune to predators themselves. 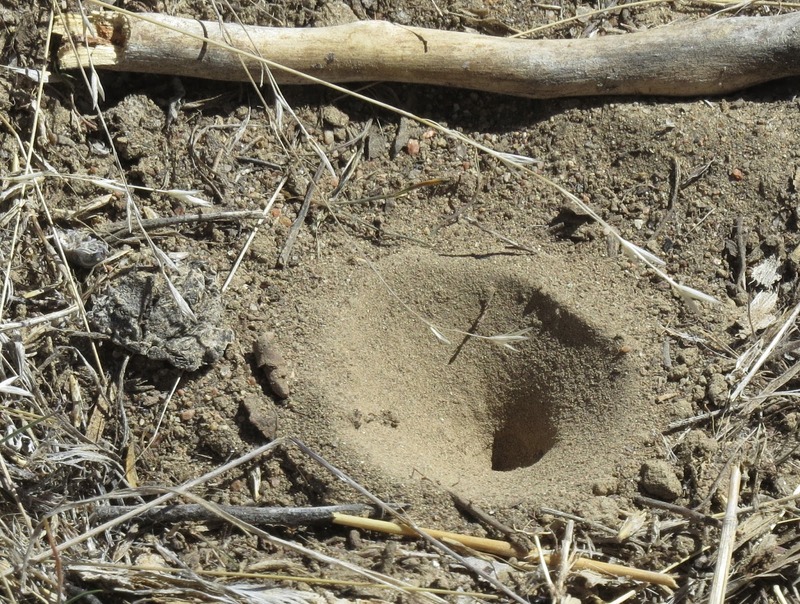 Antlions and tiger beetles are among the few predatory insects that kill and eat ants. Ants can bite, and either sting, or spray formic acid to defend themselves. One cannot blame a potential predator for avoiding that kind of trauma when ants are not much more than an hors d' oeuvres anyway. 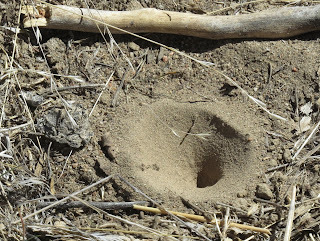 While looking for tiger beetles in Lake Pueblo State Park, Colorado on March 18, I was surprised to find the funnel trap of an antlion larva in the middle of a game trail. 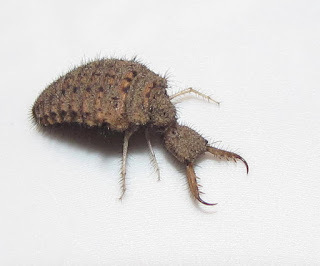 Usually, the pitfall traps of antlions are clustered, and situated in sheltered areas like beneath a rock overhang, at the base of a tree, or other location where rain seldom if ever reaches them. Since the only genus of antlions in the U.S. that makes such traps is Myrmeleon, I knew that had to be the critter lurking at the bottom of the pit. Buried just beneath the dusty sand was a single, chubby larva, studded with spines on various parts of its body, and with menacing sickle-like jaws. Nearly blind, the insect relies on its sensitivity to vibration to detect potential trouble or potential prey. 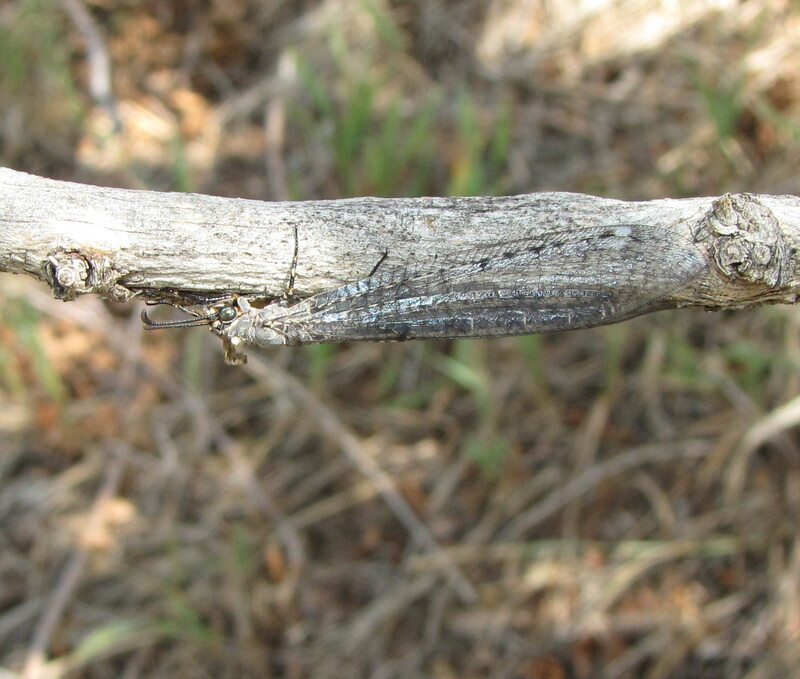 When an ant or other terrestrial insect blunders into the antlion's steep-walled trap, the larva becomes alert and proactive. It may use those jaws to fling sand onto its victim, hastening its descent to the bottom of the funnel. 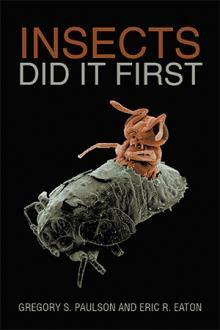 The predator then grabs its prey and injects it with enzymes that paralyze it and begin the digestive process. Antlions go through complete metamorphosis, so the larva eventually constructs a cocoon of sand and silk in which it pupates. An adult antlion, more than making up for its youthful ugliness with its delicate wings and slender body, emerges from the pupa at a later date. The fate of ants in the jaws of an antlion may seem morbid, but it is still better than what happens to ants caught by adult tiger beetles. 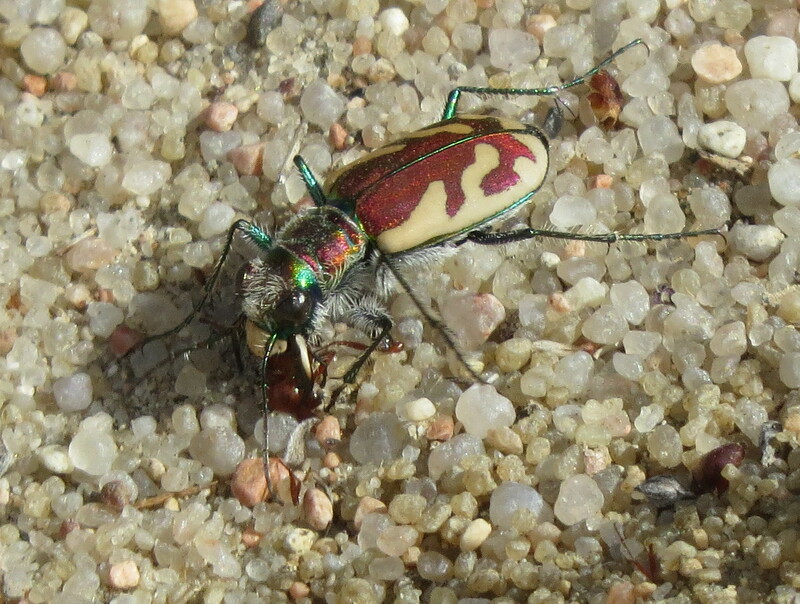 After two consecutive days of unsuccessful searching for tiger beetles closer to home in Colorado Springs, I finally found at least three Blowout Tiger Beetles, Cicindela lengi, on the afternoon of March 23. I was witness to their ability to swiftly dispatch lone worker ants with their huge, toothy jaws. 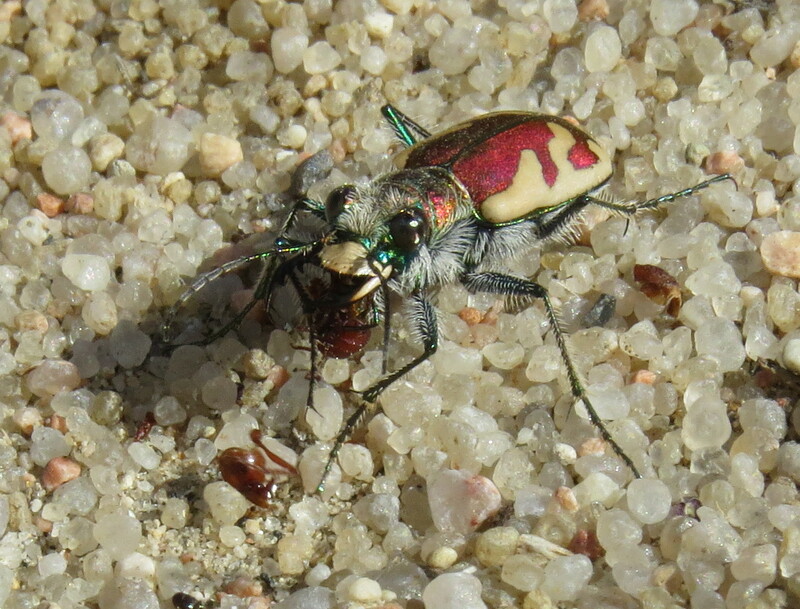 Most tiger beetle species are agile daytime hunters that haunt sandy habitats like the sandhill bordering the vacant lot where I found these specimens. The insects run quickly, stop, then run again. They fly a short distance if spooked by a potential predator. Their eyesight is keen, vastly more sensitive to motion than a person; but they focus slowly. They literally outrun their eyesight when pursuing prey, and must stop to refocus before rejoining the chase. 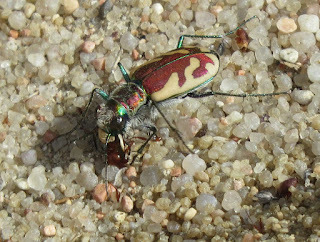 This herky-jerky hunting strategy is still effective, and few insects spotted by a tiger beetle will live to tell the tale. Tiger beetles appear to have the speed and power to attack insects and other invertebrates at least as large as they are, but most of their victims are quite small. Ants seem to be near the limit of what they will take. They make short work of even the feisty Western Harvester Ants, Pogonomyrmex occidentalis, that are abundant in Colorado Springs. 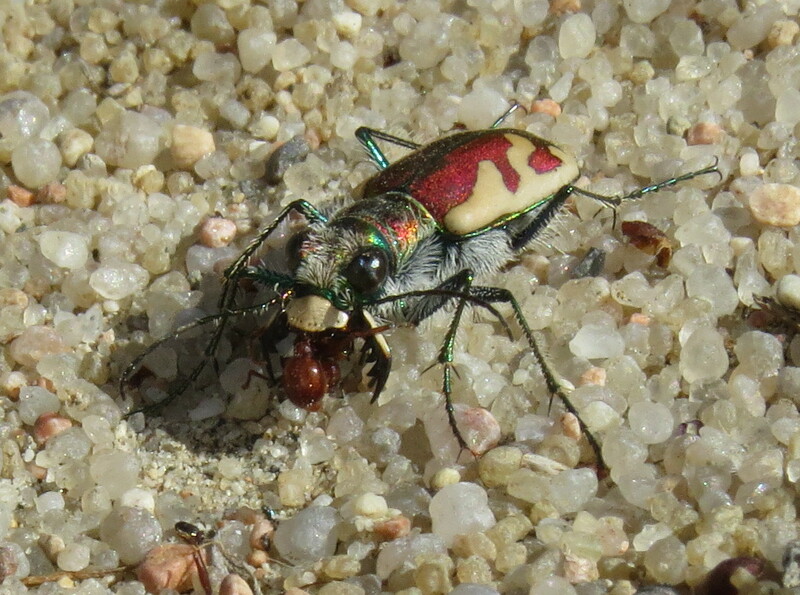 The jaws of the beetle quickly dismember the ant, leaving a trail of carnage around the beetle. 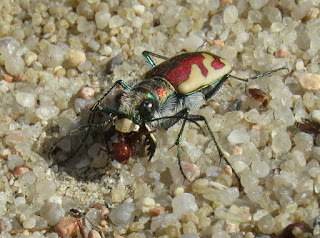 The beetle's next victim may be a tiny, unidentifiable invertebrate it plucks from between sand grains. 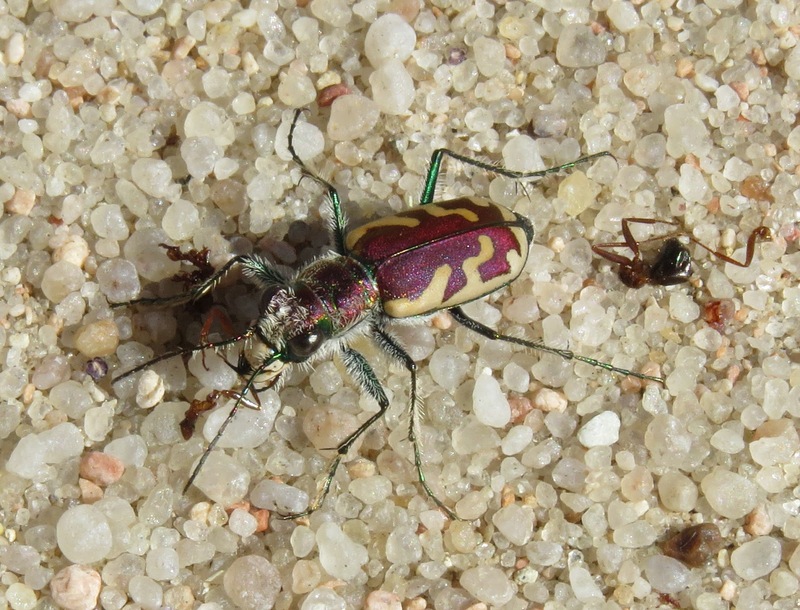 Most tiger beetle enthusiasts are fond of remarking that they are glad tiger beetles do not get any larger in size than they do. Indeed, I would not be prowling around dunes and beaches if there were even raccoon-sized tiger beetles in the neighborhood. Since they are much smaller than that, I recommend going in search of them. Their beauty and behaviors are sure to capture your curiosity and sense of wonder.